It's been just over a week since the announcement of the delay of Constantinople, the hard fork upgrade coming to the Ethereum network. News of the delay did not seem to hurt Ethereum all that much against the current bear market. 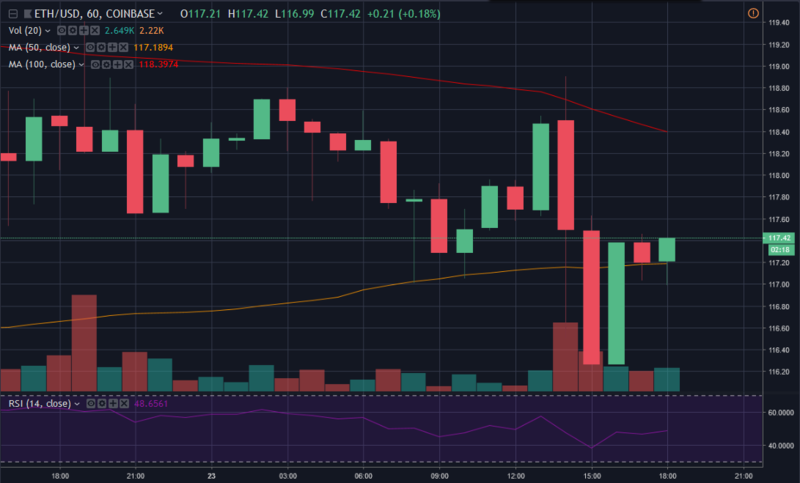 Today Ethereum is in a consolidation pattern that closely resembles most of the market, and is currently testing support and resistance on key moving averages. - News of hard fork delay, and subsequent minor chain split did not significantly affect the price. - Coin is now consolidating along with most of the crypto market. - To see further upside the coin needs to get back above 50 HR MA, 50 D MA. 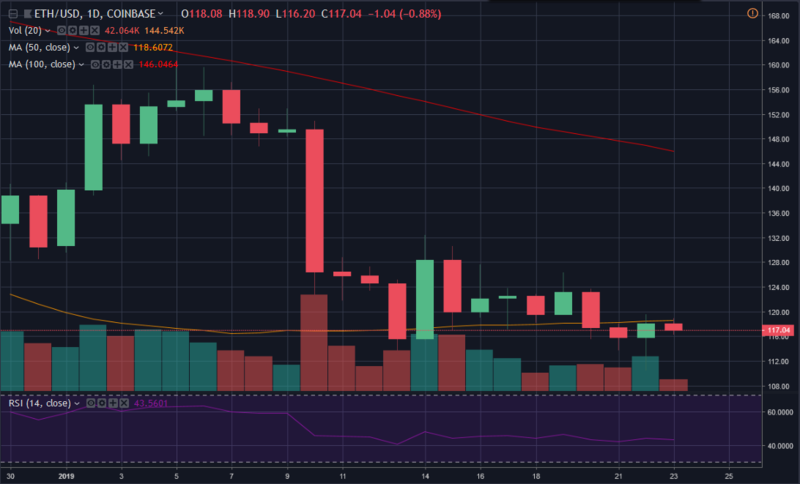 Looking on the daily timeframe we can see that Ethereum was just rejected off of resistance from the 50 Day Moving Average, at about $118.65. RSI and sell volume are rather low, so there is room for the coin to retest the 50 Day MA soon. On the 1 hour we see a similar issue emerging as the price is attempting to stay above the 50 Hr MA after dipping back below it. This will be the first hurdle for the bulls, to hold above about $117.18. If the price can hold above the 50 Hr MA, it can go on to test the 50 Day MA. This would be a bullish start for the coin to push upwards, possibly even into the low 120's, where previous resistance was met. Should the price fall below the 50 Hr MA and stay there, it could cause further downside to at least the recent lows of $116.30, or if we break past there, maybe $115. In general Ethereum is moving more or less along with the market at this time. If the hard fork news didn't devastate the price, it is probably solid for at least the time being. The bottom may not be in yet, but we are likely close to it.